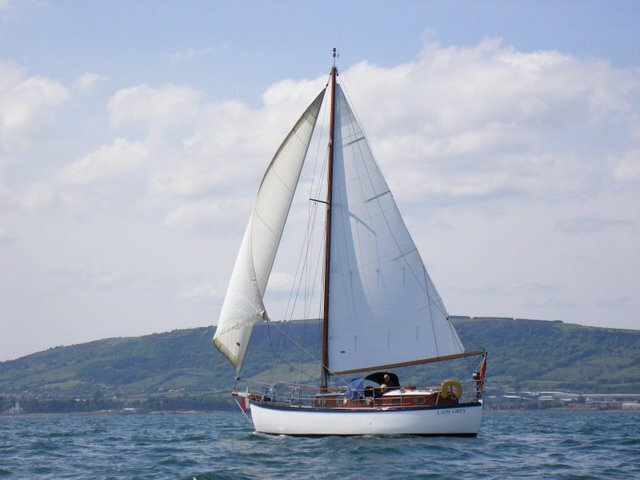 Lady Grey is a 50 year old cutter rigged cruising yacht, built for comfort not for speed. 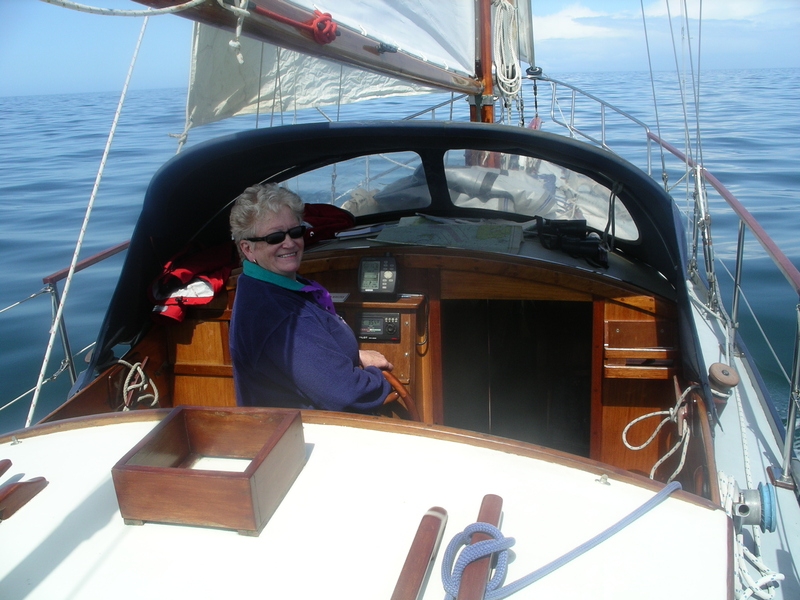 My wife Linda and I have been cruising the West of Scotland with Lady Grey for 16 years. Last year I noticed a slight smell of burning oil coming from the the original 12 horse power Petters oil engine . In March I decide to investigate and so off with the cylinder heads. The bores are a bit worn so the barrels are removed in order to examine the pistons. New pistons and liners are obtained along with some new gaskets and four valve guides. I fit the pistons and liners, OD Cars look after the heads, Gary Wishart in Ballymena sorts out the injector pumps. The injectors are ok, and soon the engine is going again complete with a new coat of paint. I get a new pair of sailing wellies from Caters and during the first week of May all stores are brought aboard. Saturday 9th May The grass is cut and we board Lady Grey. After a couple of pints in the club in Carrick we settle down for the night aiming for a 0330 start, planning to anchor off at Glenarm for three hours and take the next tide for Gigha. Sunday 10th May. As it happens the alarm on my new mobile phone fails and I wake at 0400. We dress hastily and are away by 0415. Cloghan Jetty slips by in daylight and we encounter foul tide at Muck due to the delay. We carry on past Glenarm and proceed Northwards down to three Knots as we tuck into bacon butties. By 1245 (HW Dover) we are making 4.5 knots abeam Rathlin. The sea is smooth and it is a beautiful sunny day. We see several porpoises. Off the Mull we are at mid tide and the GPS indicates nine knots, great stuff! The sky remains cloudless as we pick up a mooring in Ardminish Bay at 1815, fourteen hours out of Carrickfergus.It has been a long day so we dine on board and turn in early. Monday 11th May It is a glorious morning and although there was some wind coming into the bay during the night, by morning it has eased and the bay is calm. After breakfast we go ashore but first a visit to the shop. Paul left in February and the new owners are a Dutch couple, Rudi and Ali. They are not used to Norn Iron accents yet and my request for a Daily Telegraph produces nil response! Next off to visit our good friend John Martin at Burnside. As usual his door is unlocked and we go on in. He emerges from the shower, dons his dressing gown and greets us in his usual hearty manner. It is agreed that John will dine with us on board Lady Grey this evening, also if we can locate her, Vi Tulloch, the island sculptress. Meanwhile we go off to visit the Achamore Gardens. This is the first time we have been here in May and the Rhododendrons are magnificent. I take a few photos. By the time we get back to the shop the papers are in, even a Daily Telegraph. We proceed to the Hotel for a pint and a look at the crossword. This sailing lark is all very strenuous. Vi is out, so we go back on board to get the cottage pie ready. As we have some time in hand we dinghy to the beach by the old boathouse to sunbathe. Linda has the misfortune to be attacked by a mad collie dog, fortunately it is muzzled and no blood is drawn but it is a scary moment, the dog could have been seriously injured!! Back on board the coastguard is predicting Easterly 5 to 7 for Wednesday so we decide we will move to Craobh Haven tomorrow. I go ashore to meet up with John and call with Vi, she is delighted to be asked out for dinner and we meet John in the hotel. Vi is now in her ninetieth year and her sight is failing but she is a rare and gutsy character, getting her on board is made easier as we have brought the boarding ladder this year. Dinner is excellent as usual, Vi enjoys the red wine and reckons it is just the right temperature, the craic is mighty. Vi cruised some years ago with a friend in his Clyde Cruiser Racer and has many exciting tales to tell. Anyway, by 2230 I dinghy the visitors ashore. There is a little concern regarding the two sailors on a nearby yacht who motored off in their dinghy this morning, they have not yet returned,. John will inform the coastguard. Tuesday 12th May After a quick foray ashore for a paper we cast off and head North. The wind is easterly in the Sound of Jura, quite fresh at times and we make good progress. Corrievreckan, the eddies are spectacular. A call to Croabh is made and we slip into berth B28 at 1750, journey time seven hours and 36 miles covered. In spite of the rather strong wind at times it has been a pleasant sunny day and on our pontoon at Craobh we can barely feel a breeze. Linda is soon busy in the galley and before you know it John’s razor clams are served with garlic butter. The remainder of yesterday’s mince is turned into patties and goes down well with fresh veg. It is a beautiful settled evening as we call up Sandy and Rhona, our friends who live nearby at Ardfern. We arrange to see them the next day at lunchtime. Wednesday 13th May After breakfast we put on the walking gear and proceed over the hill to Ardfern. Sandy is busy concreting-in some posts to form a retaining wall, he is just finishing as we arrive and is washing out the mixer.Soon the wine is opened and we enjoy a bit of chat over a glass or two then lunch of Rhona’s delicious panninis. We later make a risky decision to visit the yacht haven shop where, sure enough, Linda finds a very nice Joules top. Lady Grey is treated to a new engine battery and Sandy kindly returns us to Craobh in his Volvo. This evening we dine in Lord Of The Isles, Linda enjoyed her salmon and my pork loin was excellent. If only they would heat the plates! Anyway, we enjoyed another settled night in Craobh. Tomorrow the Cuan Sound is fair from around 1500 so there is no rush in the morning.